One Day on Our Blue Planet: In the Antarctic on TheBookSeekers. 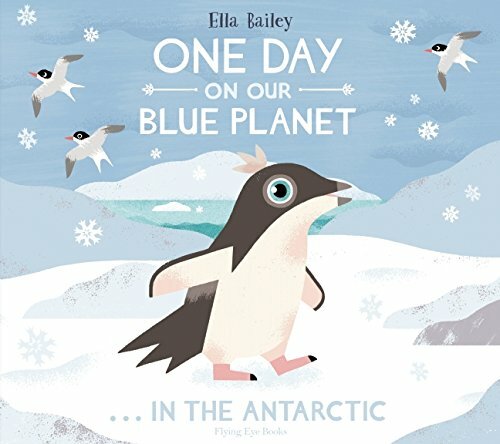 From breakfast to dinner, dusk to dawn, children will love spending the day with this curious penguin chick.In the latest volume of Ella Baileys picture book exploration of the daily lives of baby animals, we head to the ice shelf to meet a young penguin chick. What does she and her family eat? How many brothers and sisters does she have? What do they do for fun? This is a lovely non fiction picture book by Ella Bailey which describes the experiences of a penguin chick during a single day. The chick starts off with a meal from her parents before she heads off across the ice and into the great Antarctic Ocean. As she searches for food she views the vast underwater world, home to predators as well as friends. The illustrations are particularly beautiful - lots of blues and greens. And the two end papers illustrate with names the animals which live above and below the ice in the Antarctic, perfect for spotting with your child.